Peninsular Malaysia, also known as Malaya or West Malaysia, is the part of Malaysia which lies on the Malay Peninsula and surrounding islands. Its area is 132,265 square kilometres (51,068 sq mi), which is nearly 40% of the total area of the country - or slightly bigger than England (130,395 km²) and South Korea (100,363 km²). It shares a land border with Thailand in the north. To the south is the island of Singapore. Across the Strait of Malacca to the west lies the Sumatra Island (Indonesia) and across the South China Sea to the east lies the Natuna Islands (Indonesia). Peninsular Malaysia accounts for the majority (roughly 81.3%) of Malaysia's population and economy; as of 2017 its population is roughly 26 million (92% of total population). Peninsular Malaysia is also known as West Malaysia (Malaysia Barat) or the States of Malaya (Negeri-negeri Tanah Melayu). The majority of people on Peninsular Malaysia are ethnic Malays, predominantly Muslim. Large Chinese and Indian populations exist. The Orang Asli are the indigenous people of Peninsular Malaysia; they number around 140,000 and mostly lived in inland parts of the region. The Northern Region: Perlis, Kedah, Penang and Perak. The Central Region: Selangor and the federal territories of Kuala Lumpur and Putrajaya. The Southern Region: Negeri Sembilan, Melaka and Johor. 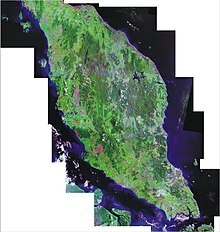 Even though Johor has a coastline facing the South China Sea on the Pacific Ocean, it is not generally regarded as an East Coast state, since the main coastline of the state is located on the Straits of Johor of the Indian Ocean. The distinction between West and East Malaysia (Sabah and Sarawak) is significant beyond the sphere of geography, because as well as they were separate regions before the formation of The Federation of Malaysia, thus having a different court structure, and the eastern states have more autonomy than the original States of Malaya, for example, autonomy in immigration. These rights were granted as part of Sarawak's 18-point agreement and Sabah's 20-point agreement with Federation of Malaya in forming the Federation of Malaysia. ^ Mohamed Anwar Omar Din (2012). "Legitimacy of the Malays as the Sons of the Soil". Canadian Center of Science and Education. pp. 80–81. ISSN 1911-2025. ^ Reid, Anthony (2010). Imperial alchemy : nationalism and political identity in Southeast Asia. Cambridge University Press. p. 95. ISBN 978-0-521-87237-9. This page was last edited on 13 April 2019, at 09:38 (UTC).